The final games have been played, awards have been presented, and now all eyes of the hockey world are focused on Dallas where the future of the National Hockey League will be unveiled. American Airlines Center is home of the NHL’s Stars but this weekend it’s the stars of the Canadian Hockey League who will grace the stage at the 2018 NHL Draft beginning Friday night. 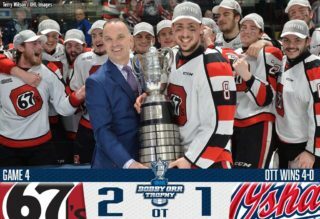 A total of 217 names will be called throughout the seven round process largely comprised of talent from across the Ontario Hockey League, Western Hockey League, and Quebec Major Junior Hockey League. 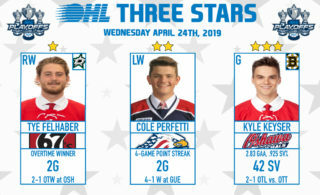 Andrei Svechnikov of the Barrie Colts who earned OHL Rookie of the Year honours as well as the CHL’s Top Prospect of the Year award headlines a list of 143 CHL players (61 OHL players) ranked by NHL Central Scouting. The skilled forward sat alongside several other top prospects including Evan Bouchard of the London Knights at a media availability session on Thursday afternoon at Reunion Tower, a famous Dallas landmark overlooking the Lone Star state skyline. 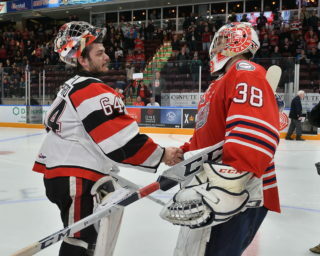 Both reflected on their season and how the OHL has helped them prepare for the excitement and challenges ahead. Bouchard has also benefited from the support received in London, especially learning about the draft process from past Knights who have been selected during his three year tenure with the club. 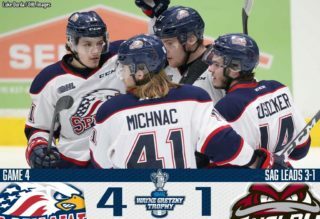 The NHL Draft unfolds for Svechnikov, Bouchard, and the rest of the hockey world on Friday night beginning at 7:00 pm Eastern on Sportsnet, followed by rounds two through seven on Saturday morning on the NHL Network.